Get packing early with these discounts! When is National Moving Day? National Moving Day is always the Tuesday after Memorial Day and sometimes is called “Crazy Tuesday” due to a spike in the moving industry on this day. Many families prepare to move right after the holiday while the kids are on summer break. It is easier relocating and getting the children settled in their new school versus a transfer in the middle of the school year. They have more time to acclimate to their new surroundings and develop friendships before starting school in the Fall. If you are moving this Summer start planning early by determining the number of boxes and supplies you will need. Get quotes ahead of time to budget your expenses. 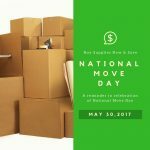 Ask which days may provide a discount or any special promotions the companies may have for National Move Day. The moving season peak is from May to September and follows the public school calendar. The Big Tuesday after Memorial Day is the busiest day of the year so book early and get your reservations in place! There are a few tips to take the stress out of preparing to move. Choose your services and book early. If you need to sell your house first then you can prepare a list once you have a solid contract on the house. Remember deals can fall through but a good real estate agent can help protect you and keep you informed on your forecasted closing day. Choose Services – choose which services you will be required to move. Do you need a full-service interstate mover or are you moving locally? Will you require a full-service local company or will you pack and unpack your own belongings? Are you going to use a rental truck or container type moving? Maybe you need a little extra hand with moving laborers. Will you need temporary storage or long-term storage? All these questions will help you determine your services. Get Quotes - Once you select your services to get several moving quotes to determine your final costs and start doing your due diligence on the moving companies you have selected. Check online reviews, BBB, State Licenses and Moving affiliation certificates such as AMSA and local state organization for professional movers. Select Packing Materials – Packing correctly is essential when moving your household items. Uboxes moving kits are the best value and contain all the packing materials needed for the number of rooms designated by the kit. If you have minimal items you may choose the economy kits and if you have more items choose the bigger box kits. Or if you are a fashionista choose the wardrobe box kits that move your items from one closet to another without getting wrinkled. Household Inventory – Be sure to inventory your items and you may want to photograph prior to packing. This way you have a list in case you need for insurance purposes. Always check your insurance policies to see if you need additional coverage including the insurance on the rental truck. Go room by room and document throughout your household all the valuables and items you plan to take with you. When packing start to stay organized go from room to room and keep similar type items together. Organize Your Inventory - For example, if you have a library start by packing smaller books in a box, then medium and larger books. Keep knick-knacks together and be sure to use the correct packing materials. If you have a flat-screen TV or China Uboxes has a variety of specialty moving boxes. After all, you spent good money on your items and the cost of the proper packing materials is minimal if some of the items break from Improper packing.